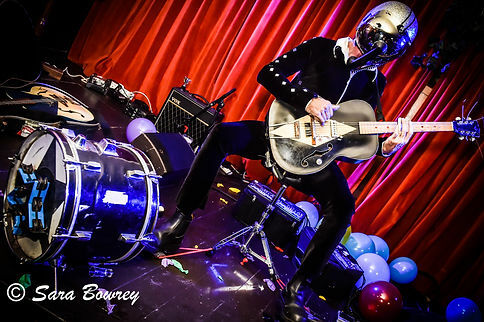 Bob Log III is the Stig of the blues world…shadowy master of his art – clad in a human cannonball jumpsuit with his face forever hidden behind the reflective glass of his ever-present crash helmet. He returned to Hastings tonight after a four-year gap since his last gig at the Brass Monkey way back in 2012. Of course he’s been busy over that time. With a typical year seeing him play around 150 shows he knows exactly how to work a crowd. Tonight at The Albion he wields his chosen weapons with the usual wild abandon. Those dirty sounding Silvertone Archtop guitars and the telephone receiver microphone glued to his faceplate giving him his trademark sound. The venue is a great one for intimate shows of this kind. The stage isn’t high, but the room isn’t large – and the sound is really rather good. We are treated to many of Bob’s usual antics – but every one, as rehearsed as it might be, comes across as a relaxed and natural ‘happening’. We blow up balloons. Bob stomps around bursting them in time to his howling slide guitar. We buy him ‘liquid applause. Bob takes the occasional sip, whilst being careful never to reveal his face. Bob launches himself onto the crowd in a small inflatable dinghy. We carry him victorious around the room above our heads. Bob leads a procession out onto the street as his wireless guitar continues to howl through speakers back in the venue. We follow joyfully and scamper around after him like children following the pied piper. Tonight has one surprise in store for Bob though. His stage is briefly invaded by the pub’s excited pug dog who takes a shine to the balloons and does her level best to burst a few for good measure. To say this was a value for money night would be a serious understatement. Some locals were, however, a little taken aback by the door charge. £12.50 is really a bargain for a gig like this, but, probably because The Albion only stages about three or four paying shows each year (putting on tonnes of free music the rest of the time), the cover price obviously caught some unawares. This seems to be the ‘old town problem’ – talking to promoters about it over the last few weeks many have said how they have had their fingers burned because of the unwillingness of many locals to pay for live music. The issue isn’t, however, one of stinginess – it’s simply a factor of there being so many talented musicians in town and so many venues prepared to book them to play free entry shows. What this means is people get used to spending money at the bar, not at the door. So a little work needs to be done to work out how best to promote these sorts of quality ticketed gigs in Hastings. We’d love to see more acts adding the town to their tour schedules – but we have to make it pay for them.